with ​a Doctor, two kids & two dogs. We are a family of 4 with 2 little kids, and found this to be the perfect home for our Whistler vacation. Paul and Sarah really have the place set up to make you feel at home from the minute you arrive, and the location is great with easy access to the Village and Valley Trail. We visited in October, so the weather allowed for plenty of playtime outside in the yard, which is as nice as it looks in the pictures. Inside, the floorplan is set up nicely with the 3 rooms on one side, and the living spaces on the other...so any noise being made in the living area early in the morning can't be heard in the bedrooms by anyone sleeping in. The kitchen has nice modern appliances, and the TVs and furniture are all up-to-date to meet expectations. We used the hot tub a couple of times, and found it to be a great way to relax at the end of the day. It is a duplex, but we felt like we had the entire property to ourselves, and only saw Paul when we reached out to ask for some recommendations (and he was super quick and helpful with some local tips). We highly recommend this property to anyone that is looking for a modern, clean place...and if you are a family with needs for children, we can't think of a better situation. a wonderful thank you to Tanner & Jenny for their choice to stay with us at Brio House, and to share their experience. We look forward to welcoming you back to Brio in the near future. So a few of our summer guests who are travelling from further afield have asked "what are the must do's in a 3 day trip?" This is a tricky one to answer, as we all have different tastes and enjoyment's, kids of different ages have different abilities and stamina, so what might be a short hike for some might be a real challenge for others. 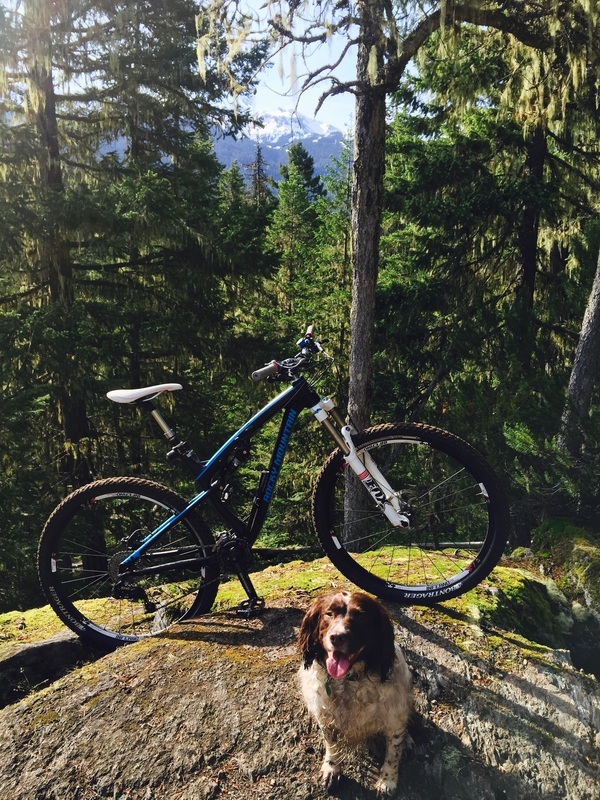 The Valley Trail system connects everywhere in Whistler, and if your brining bikes, hiring bikes, or just enjoy hiking your way around, its entirely possible and extremely enjoyable to leave the car keys in your vacation home. A fun and accessible way to experience Whistler with the whole family - including the dog! This is our personal favourite year round, and in the summer from Brio House a beautiful route to enjoy is around Whistler Golf Course and then take the Rainbow Trail to Rainbow Lake which takes you over bridges and streams, truly idyllic. Everyone enjoys a picnic and a swim in the lake. When Whistler is in full summer it can get pretty hot, and an average July / August day can be between 25-30c, so a dip in one of the lakes can be just what the doctor ordered. Beware that some of the lakes are Glacier fed lakes and can be 'quite refreshing'!!! One of my favourite areas to stroll around, or cycle leisurely is Lost Lake. There is something for everyone, a great picnic area, and some beautiful trails that will take you higher if you want some exercise. 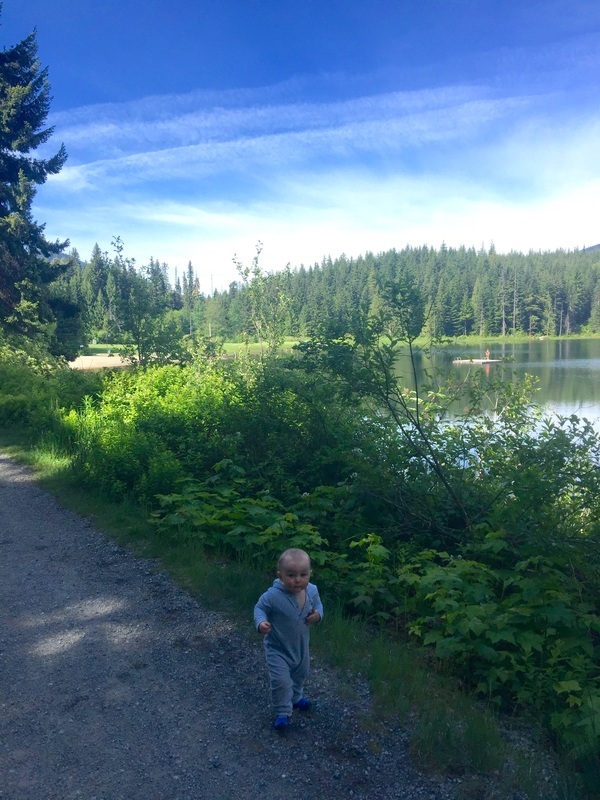 Alta Lake is only a few minutes walk from Brio House, and as well as a lovely beach and picnic area there are boat rentals, canoe rentals and stand up paddle board. You can also take a tour of the River of Golden Dreams. An absolute must is to visit our Alpine areas and enjoy the Peak to Peak 360 experience. Whistler’s pinnacle summer experience is more than sightseeing and a ride and on the Guinness World Record breaking PEAK 2 PEAK Gondola. It’s the entire 360 degree experience that comes with it: two side-by-side mountains, 50+ km of hiking and walking trails at the height of summer, mind-melting alpine vistas, free and custom guided tours, viewpoints in every direction, and an ever changing timeline of seasonal highlights that makes no two visits the same. A labyrinth of snow walls towers above Pika's Traverse hiking road on Whistler Mountain for a short period of time in early summer. The walls are carved from the abundance of snow received from the winter past to give access for both staff and guests to get into the alpine. But they don't last forever. Experience them before they melt, this is 60-90 MINUTE ROUND TRIP FROM ROUNDHOUSE LODGE. July 29 - August 1, 2016British Columbia celebrates family like no other place on earth. This annual event celebrates everything family in every way possible, and there's no better place to enjoy time with family than in Whistler. 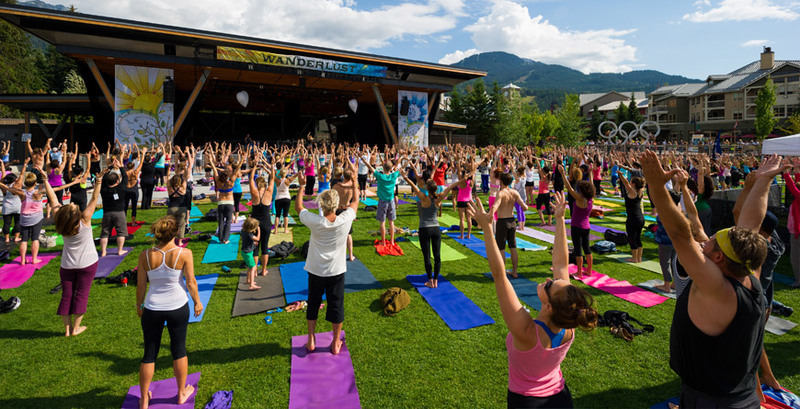 The BC Family day long weekend starts this year on July 29th with the opening of the Wanderlust Festival in Whistler, and the start of the annual summer concert series. 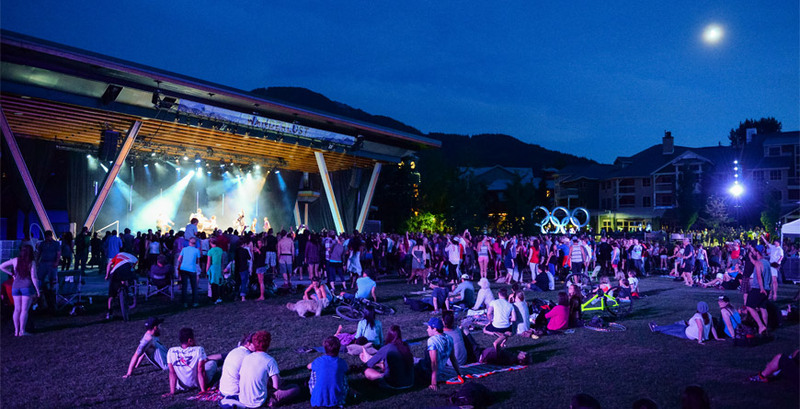 July 29th see's Deya Dova in the Whistler Olympic Plaza at 8pm. There's a saying I heard when I first moved to Whistler. "People move here for the winters, but they stay for the summers." You only need two weeks of a Whistler summer to want more and understand exactly what the locals are talking about. Of course, summer also brings Canada Day, a day to celebrate all things Canadian with fervent national pride. 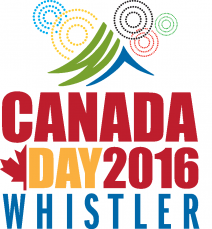 Whistler knows how to celebrate our national pride! Digging out our best red and white accessories there is a full day of fun and activities for the whole family. Some of the best XC riding in Whistler is on our doorstep. There are great big rides on the Westside, which will take you up the Flank Trail and descend 'Howler' a black trail that descends the entire side of the mountain and is quite literally 'Epic'. The pic below was taken at the beginning of the descent into Howler, and takes in the entire Whistler valley. Hikes even a 1 year old can enjoy! 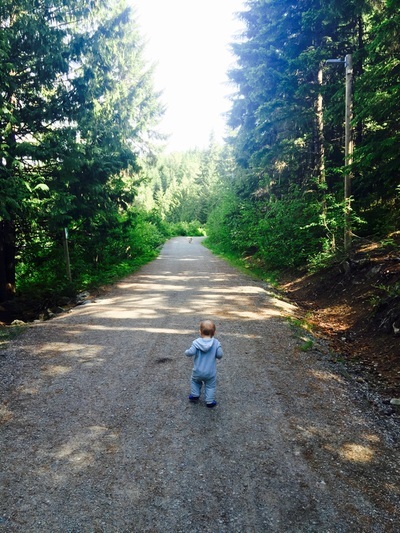 The valley trail system, and lakes of Whistler can be enjoyed by the whole family. Lost Lake is one of our favourite places, and it is incredibly diverse. On the Blackcomb side, there is parking or free drop off on the N0 4 shuttle bus (summer months only) where you will find a gentle beach, picnic tables & bbq area, and a swim platform for the kids to play on. The lake is surrounded by a crushed gravel wide path for gentle walking or cycling. Jack is 16 months in this picture, and was walking form the beach to the dog beach area, about 1km. The dog beach is an off leash area where four legged furry friends can frolic, splash and swim. There is another swim platform here for adventurous owners who want to swim with their four legged pals. The path continues around and leads off to a slightly more adventurous path system that winds up into the rain forest. Here you can hike to your hearts content. A full lap is about 10km, but you can keep it shorter by following the well marked trail guides. For bikers in summer months, hidden amongst the tree's are the Zappa Trails, which rank among the best and toughest single track in the world, with names like "The pain never stops" It is usual to start at the Passive Haus, and ascend Peaches & Regalia. From there follow the trails and ascend over rock and root to the more advanced Pinnochio's furniture, Fountain of Love, Toads of the Short Forest and take a breather. This is about half way, and its a hard climb to here of about 5km. From here it's a great rip roaring descent along to "Gee I like your pants" and "Jelly Roll Gum Drops". This shoots you out near the River Run campground, which has a great breakfast stop. If your up for more riding, dig deep and climb up Hook Tender, a power climb back into the Zappa's. ​Turn into "Treacherous Cretin's", followed by "Central Scrutinizer", 'Packard Goose" and finally another climb before a fun descent on "Grand Wazoo" which emerges by the beach area. Total loop is about 10km. There are dozens of little cut off's. You should only ride these trails if you are comfortable with rocks, roots, wooden bridges, and some drops (which are all marked). Some are more challenging than others, and I will be writing blog on just an introductory loop in the next few days. This was Henry's first full year at Kinder Kids, in Creekside. As a local Henry joins a number of his friends aged 3-5 and they spend 2 days a week on the mountain, learning how to ski safely, and much more about the snow pack, tree well's, safety on the mountain. Our little boy of 4 is fast becoming a mountain boy. His love of the skiing is there, which is amazing to watch grow. We took a couple of days out in the mid season to ski with him. It was 'A'mazing. Our great friends the Holder's visited us in Whistler this year, and it was fantastic to finally ski with them again, although there were some HUGE changes. The two girls, Daisy and Florence (Flo) were now young ladies, and total demons on the snow. Alfie, now a young man was just....well fast! All three were fearless. I made this little video as a memento of a couple of fun days with some great snow.